One can also download reports in convenient formats. This system also automates financial compliances like TDS and Schedule. It also provides multiple formats for balance sheets. This product can be an easy integration for Indian Customers who are planning to use NetSuite. It complies from TDS to GST and all the other localized needs. Automated Indian subsidiary taxation for NetSuite One World customer. With the help of this Suite bundle, one can seamlessly integrate all transactions wherever localization is required. Without this bundle, NetSuite customers have to manually post journals to take care of withholding tax, manually compute the tax accrual and payment rules, take the figures and data to create the reports manually. All of this is addressed in one bundle of IIT. This bundle will seamlessly integrate with the purchase orders, Vendor Bills, Sales Orders, Invoices and different related transactions for Indian localization needs of TDS, GST and other related taxes. This bundle provides detailed vendor and customer statement specific to Indian requirements and allows printing of all transactions. All statutory reports, required on GST and TDS are available which can be further downloaded in convenient formats. This bundle supports new formats of Schedule VI for Balance Sheet. It helps in defining GST registration details at different entity level. It also captures Tax details at customer and the vendor level. It has the provision of defining different tax types. It configures the different tax codes and groups. Defines auto numbering for sales in invoices. Tax details and attributes are captured on transaction level. GST tax posting input and output. Input tax credit utilization against payable for GST taxes. GST tax returns (GSTR 1, 2, 3&6). Why should one collaborate with Inspirria? We initiate as we understand all your objectives and deliver the functional scope. We initiate analyze your business needs and develop a project work-plan according to that. We initiate design with the help of Customization Solution Design & Integration Design as NetSuite addresses your business needs. We initiate configure the NetSuite’s solution in a way that it adapts to your business. We initiate validate the solution so that it is deployed easily. We initiate deploy the solution and your business is now powered with NetSuite. We initiate optimize, learn from the solution and move to the NetSuite support. 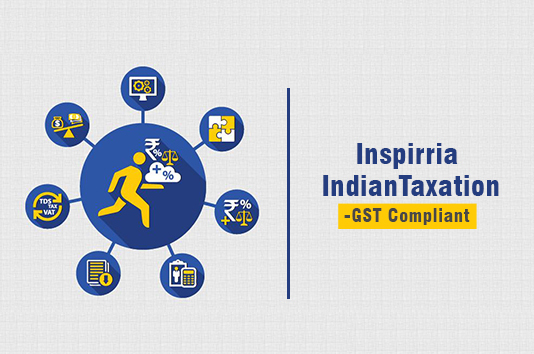 Are you in search of a system which is GST Compliant and created keeping in mind all the Indian Taxation Rules? We at Inspirria Cloudtech, are here to help you. You can take us as your secured NetSuite partner and NetSuite Implementation Partners with a decade plus of experience working with 500+ Cloud projects. We push productivity to its optimum level with some proven solutions that are used by best companies all over the world.